Grason Ratowsky in his Mallorca Studio, 2017. Last year, I was introduced to Grason Ratowsky through mutual friends in New York. For over 15 years I have scouted artists, counseled artists, and provided connections to help sell their work. For the first time in many years, I felt so strongly about an artist that I signed an exclusive agreement. Grason was featured in the July 2018 issue of Architectural Digest Spain and I'm delighted to announce our exciting collaboration! Check out images from his studio here. Recently I sat down with Grason and hope you'll take a few minutes to get to know him. To receive a catalog of works, email me on kc@kipton.com or click here to view works available online. Stay tuned for what's ahead! 1. K: I know you have a history in design and art in NYC, but now you’re launching Studio Ratowsky and spending part time in Mallorca. Tell us a little about that transition and the development of Studio Ratowsky in the Mediterranean. G: My wife and I decided to engage on a new personal journey and spend part of our time on the island of Mallorca where we’ve welcomed in a more natural, intuitive pace of life. A part of this decision was derived from the realization that in each role I’ve fulfilled within the industry of art and design, I’ve found the times I enjoyed the most were when I was working with my hands. At my core, I simply love to physically create. With this knowledge in mind, I set out to build Studio Ratowsky. 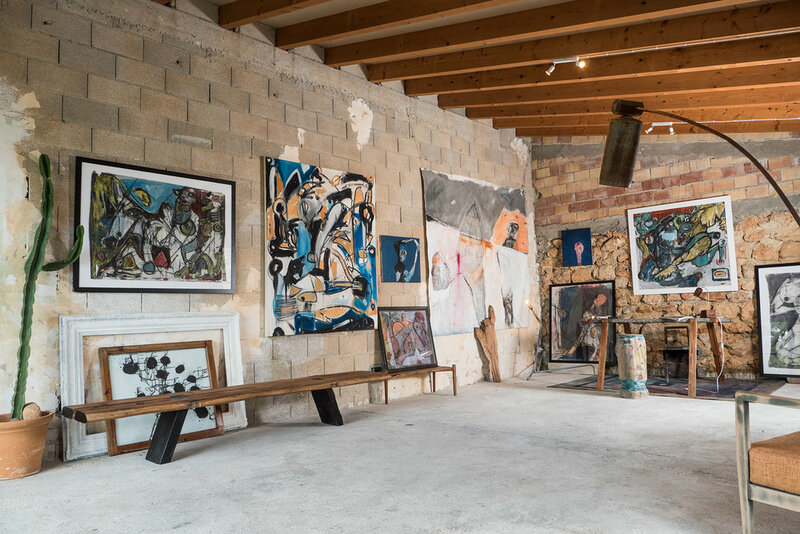 The space was envisioned and transformed from an old lamb feeding den from the 1600s into a creative space where I develop and showcase my works of art varying from fine art paintings to functional art such as creative furniture and lighting. 2. K: Tell us a bit about your upbringing and background in the arts. G: Like each artist, I feel there has been a vast range of influence that has ignited creativity in my life, though in my opinion, the two most prolific influential factors are family and experience. I’ve been surrounded and supported by the arts since I was born. Both my father and mother are artists and have instilled in me a deep rooted sense of ability to create and develop whatever my imagination will allow. With this ability comes an immense sense of freedom which only further propels the need to create. It has become a self sustaining artistic cycle that I am controlled by, and also deeply grateful for. Beyond my upbringing and the artistic influence that runs in my blood, there is the inspiration that derives from travel. From exciting the senses. From experience. Growing up, my family and I tasted the world. We’ve lived around the globe, have met an immense amount of interesting beings and have experienced a great deal. I believe that although this lifestyle forgoes a certain level of normality, to me the positive influences ring true. I have been fortunate to experience different communities, different cultures, different ways of thought, different ways of belief. Living in, and understanding these various stories from such a range of viewpoints allows your eyes to be opened to ever expanding possibilities. I feel each of these experiences have contributed to the inspiration that is ingrained like woven fibers within my works of art in all of its forms. 3. K: I’m glad you mentioned the range of influence in your work. Your work seems prolific and ranges from fine to functional art. Is there a common thread that creates a link through your different works? G: [laughs] Well yes, but I’m not positive I can describe it. I think ultimately, it goes back to experience and surroundings. When I am in my studio in Mallorca my works feel different than the work I create in NYC, but the feeling or voice of the work that is developed in any given space or scenario during a certain time is mostly always cohesive and specific. For instance, recent pieces that I’ve been developing of both fine and functional art have a similar soul because they have been created in the same space and at the same time as each other. Color systems, material selection, methodology and process are all evident in work created from a similar mental space and inevitably carry through the works of art whether that be a unit of seating or a painting. 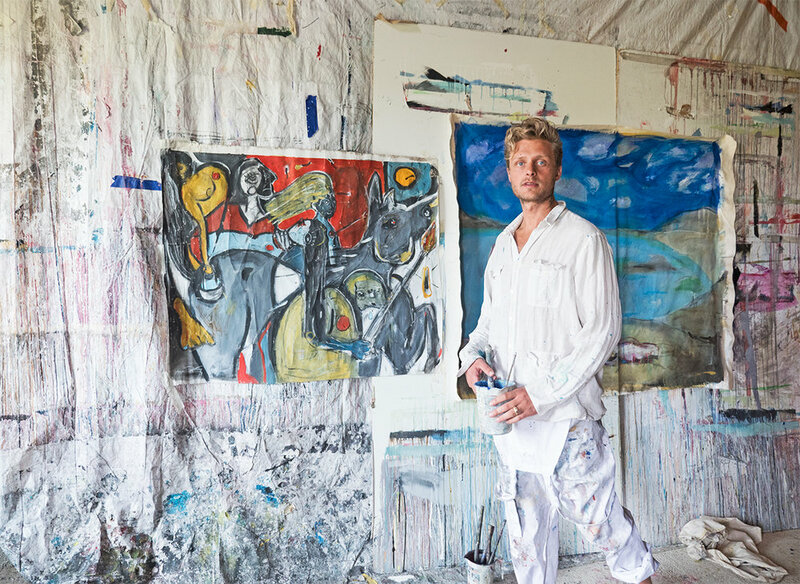 Inside Grason Ratowsky's Studio, Mallorca, Spain. 4. K: Please describe your artistic process. G: The recipe differs from method to method. Design & development of functional art such as furniture is far more process oriented and methodical. I’ve worked professionally across sectors of design, so I am aware the established process and knowledge of development is necessary for a piece to operate effectively. My mother used to say that as far as design is concerned, everything one creates should be both beautiful and functional. That phrase has proven itself useful on countless occasions when calculating process. With fine art such as painting, a greater level of freedom is allowed, in my applied style at least. I have been focusing on contemporary abstract and post neo-expressionism, which to me is all about setting the subconscious free. It’s about giving a voice to a part of you you didn’t even know needed to be heard. Often times I approach a surface with little intention other than exposing an undefined layer or sentiment. I move freely and create unconfined strokes until substance is formed and a meaning comes to life. I then sit back and dissect until the story reveals itself and then I highlight and build into that story. There is a gestural quality in painting. Strokes feel alive, they are living but immortal marks that convey a momentary sentiment through the test of time. This form of art allows us humans to see beyond the physical or tangible and then create that physical and tangible element solely from an essence. I love the balance of the methods of process and get a truly unique satisfaction from both. 5. K: How do you feel your work differs within the marketplace - how is it filling a void in contemporary art on the current world stage? G: I used to assume that ultimately, good art gained a reaction from the viewer. Whether the reaction was one of promise or disgust made no difference as long as a reaction occurred. I still feel that getting that reaction from art is a good thing because a feeling is ignited in the viewer that wasn’t otherwise present. With that said, I feel that many artists in the current market have subjected their art only to gain the reaction. Many artists are making the obtainment of reaction the art itself. i.e. the stranger the better. I don’t agree with this method but I do believe the imposing spread of this thinking has left a market void to be re-filled with art that has emotion, movement and current freshness while still respecting the history of art as well as its ever evolving theoretical values. My style is incredibly unique to me. My works have a voice and hand that is unmistakable, which as you know is of utmost importance in the sustainability of art as well as securing and preserving the image of the artist. I think unique art tells a unique story. It moves people. It silently speaks to the viewer. It has an ingrained, layered, meaningful soul that builds an emotional dialog within people. As long as my art holds some of these qualities I believe it will continue to stand out within the current and future world stage. 6. K: What’s next? What can we expect to see from Grason Ratowsky in the future? G: This is aimed to be a truly exciting year. We’re doing some great art fairs, planning and hosting some incredible events in both NYC and Mallorca and collaborating with some world class studios for capsule functional art collections. For me, the fundamental intention remains the same; keep creating in an effort to support that ideal mergence of life and work.